Los Angeles, Sept. 17, 2012 — Targeted Medical Pharma, Inc. a specialty pharmaceutical company that develops and distributes prescription medical foods to physicians, pharmacies and skilled nursing facilities, today unveiled preliminary data indicating that its new amino acid oral formulation stimulated red blood cell and platelet development during an investigational study. Initial results showed that the company’s new amino acid based formulation increased red blood cell counts, including reticulocytes, the precursors of red blood cells, as well as hemoglobin and hematocrit. The study also found a 30 percent rise in circulating platelets after seven days, as well as a 16 percent increase in hemoglobin and a 450 percent increase in peripheral reticulocytes (p<0.01). Targeted Medical Pharma, Inc. is a specialty pharmaceutical company that develops and sells prescription medical foods to physicians, pharmacies and skilled nursing facilities for the treatment of chronic disease including pain syndromes, obesity, and sleep and cognitive disorders. Based in Los Angeles, the company’s proprietary pharmaceutical therapeutic systems are sold in the United States and Japan. The company manufactures nine proprietary medical foods, as well as 48 convenience pack kits, which pair a medical food and branded or generic pharmaceutical. These prescription medications and therapeutic systems represent a novel approach to the management of certain disease states, focusing on safety and efficacy without the deleterious side effects of traditional, high dose prescription drugs. Los Angeles, Aug. 27, 2012 – Physician Therapeutics, Inc., a division of Targeted Medical Pharma, Inc., a specialty pharmaceutical company that develops and distributes prescription medical foods to physicians, pharmacies and skilled nursing facilities, today announced the appointment of Fred McCall-Perez, Ph.D. as the company’s new director of medical affairs. In his role at Physician Therapeutics, Dr. McCall-Perez will direct the company’s medical affairs division, utilizing scientific data to foster collaboration and discussion on the adoption and utilization of prescription only medical foods in clinical practice, among key opinion leaders and the healthcare research community. Additionally, Dr. McCall-Perez will formulate an advisory board strategy and develop educational programs for prescribing physicians and healthcare professionals nationwide. Dr. McCall-Perez has more than 25 years of clinical, management and development experience in managed care, disease management and healthcare consulting to physician practices, integrated delivery networks, pharmaceutical and healthcare technology companies. He has worked in a number of high level healthcare and medical technology positions throughout his career, including founder and CEO of LifeWay Disease Management, president of American Biodyne (now Magellan) and president of the disease management division at National Health Enhancement Systems. Dr. McCall-Perez, who has published more than 25 professional articles and the book, “Physician Equity Groups and Other Emerging Entities,” was the first medical adviser for WebMD and served as president of Healthonline.com. He also served as a White House representative on healthcare reform during the Clinton administration. Prior to joining Physician Therapeutics, Dr. McCall-Perez devoted his energies to pharmaceuticals, working in genetics and most recently in neuroscience and dermatology for Valeant Pharmaceuticals. Dr. McCall-Perez received a BS in mental retardation from the University of Illinois, an MA in developmental psychology from The Ohio State University, a Ph.D. in neurologically handicapped from the University of Arizona and an MBA from the University of Miami. Physician Therapeutics’ medical foods are amino acid based, FDA-regulated medications specially formulated to meet the body’s increased nutritional requirements of disease. They are a safe and effective option for treating pain syndromes, sleep and cognitive disorders, hypertension and obesity without harmful side effects. Physician Therapeutics’ medical foods are available by prescription only and must be administered under the ongoing supervision of a physician. About Physician Therapeutics and Targeted Medical Pharma, Inc. Physician Therapeutics is a division of Targeted Medical Pharma, Inc., a specialty pharmaceutical company that develops and sells prescription medical foods to physicians, pharmacies and skilled nursing facilities for the treatment of chronic disease including pain syndromes, obesity, sleep and cognitive disorders, and hypertension. Based in Los Angeles, the company’s proprietary pharmaceutical therapeutic systems are sold in the United States and Japan. The company manufactures nine proprietary medical foods, as well as 48 convenience packed kits, which pair a medical food and branded or generic pharmaceutical. These prescription medications and therapeutic systems represent a novel approach to the management of certain disease states, focusing on safety and efficacy without the deleterious side effects of traditional, high dose prescription drugs. Los Angeles, August 7, 2012 –Targeted Medical Pharma, Inc., a specialty pharmaceutical company that develops and distributes prescription medical foods to physicians, today announced that Kerry Weems has joined the company’s board of directors. A nationally respected expert in health policy and government finance, Weems has served with distinction in the field of health care, including nearly 28 years in the Federal government, most recently as Acting Administrator of the Centers for Medicare and Medicaid Services (CMS) and as Vice-Chairman of the American Health Information Community. In those capacities, he implemented the Medicare ePrescribing program, began pilot projects for electronic health records and personal health records, and instituted a number of landmark payment reforms, including non-payment for certain medical errors, among other accomplishments. Prior to that, Weems served in a number of senior positions at the Department of Health and Human Services, including deputy chief of staff, chief financial officer and chief budget officer, overseeing a budget exceeding $700 billion. He has served in both Republican and Democratic administrations and received the highest award for civilian employees, the Presidential Rank award, from Presidents Clinton and Bush. Currently Weems serves as vice president and general manager for the Health Solutions Sector at Fairfax, VA-based General Dynamics Information Technology, a business unit of General Dynamics, where he provides executive leadership to more than 4,500 health and health information technology professionals providing solutions in fraud detection and prevention, quality and pay for performance, system and infrastructure modernization, integrated contact centers and data analytics. Teams under his guidance support the Department of Health and Human Services, Department of Veterans Affairs, Military Health System, commercial health plans and more. Prior to joining General Dynamics Information Technology, Weems led Vangent’s, Health Division, which was later acquired by General Dynamics. He holds an MBA degree from the University of New Mexico and bachelor’s degrees in philosophy and business administration from New Mexico State University. Targeted Medical Pharma, Inc., a specialty pharmaceutical company that develops and sells prescription medical foods to physicians, pharmacies and skilled nursing facilities for the treatment of chronic disease including pain syndromes, obesity, sleep and cognitive disorders. Based in Los Angeles, the company’s proprietary pharmaceutical therapeutic systems are sold in the United States and Japan. The company manufactures nine proprietary medical foods, as well as 48 convenience packed kits, which pair a medical food and branded or generic pharmaceutical. These prescription medications and therapeutic systems represent a novel approach to the management of certain disease states, focusing on safety and efficacy without the deleterious side effects of traditional, high dose prescription drugs. Los Angeles, July 17, 2012 –Targeted Medical Pharma, Inc., a specialty pharmaceutical company that develops and distributes prescription medical foods to physicians, pharmacies and skilled nursing facilities, today issued the following letter to shareholders from its Chairman and Chief Executive Officer and Chief Scientific Officer, William Shell, M.D. If one word can best characterize the past year for me and for Targeted Medical Pharma, that word would be change. It has been a fast-paced journey for all of us, marked by substantial growth that places our company on the cusp of formidable transformation. There was great progress positioning us for the introduction of promising new products, having filed multiple new patents, completing clinical trials of a treatment for Post-Traumatic Stress Disorder (PTSD) and developing an advanced obesity management system. As we enter the second half of 2012, our team is excited about the research that is now well underway on a technology, believed to be the first of its kind, for stem cell stimulation via an oral administration. As of this writing, our employee count has grown to 68 full time employees, with more than 40 direct and indirect sales representatives in our own sales force and those of our distributors. Importantly, we also strengthened our senior management team. In November, we were privileged that David Silver, M.D., an Associate Professor at UCLA School of Medicine, joined the Company as our Executive Vice President for Medical and Scientific Affairs. Dr. Silver brings tremendous expertise to Targeted Medical Pharma, and I know he will be instrumental, along with our talented team, in fostering our future growth and development. Additionally, Ron Rudolph joined us as Chief Financial Officer, Douglas Gintz came aboard as Chief Technology and Information Officer, and Dr. Lynette Gebler joined us to further develop our claims collection process. Amir Blachman was promoted to Vice President of Strategy and Operations and Corporate Secretary. More recently, we appointed a National Sales Director, Darion Petty, to lead the expansion of our footprint throughout the United States and we added a Senior Medical Science Liaison, Dr. Fred McCall-Perez, to expand our education processes to physicians, key opinion leaders and other healthcare providers. Liz was steadfastly dedicated to improving patient care and quality of life. She was unshakeable in her belief that we must better understand the safety and efficacy of pharmaceutical agents. Liz’s contributions improved, and will continue to improve, the lives of tens of thousands of people. We miss Liz deeply but are blessed to continue the work that was shaped by her legacy of caring and by her medical insights. With all the moving parts and a wonderful market opportunity before us, we also effected change in our financial structure and in our plans to soon become a publicly traded company. In preparation for public trading of our securities, and to more appropriately align our financial reporting with the underlying economics of our business, we changed the Company’s revenue recognition policy, which in turn resulted in a restatement of our financials and net operating losses for 2010 and 2011. On the positive side of the restatement, although more than $30 million in receivables from our physician clients and distributors could no longer be deemed revenue until payment is received, our physician clients and distributors remain contractually obligated to pay those amounts and those amounts will be recorded as revenue when collected. Backing up these receivables are outstanding insurance claims in excess of $50 million in claims payments. The billing and collection process is being managed by our subsidiary, Complete Claims Processing, Inc., on behalf of physician customers. The new revenue recognition policy and restatement provided the basis for filing an amended 2010 tax return in May 2012. The restatement also resulted in the conversion of a $4.3 million tax liability to a tax refund receivable in excess of $800,000 and long-term carry-forward losses in excess of $4 million. As part of the change, albeit positive to our future, a “going concern” notation, which we believe is temporary, was included in the auditor’s report on our fiscal year 2011 financial statements. In part, the revenue recognition policy change and restatement of our financial statements led us to change our plans with regard to our methodology for creating a public trading market in our securities, and on June 5, 2012, we withdrew our registration statement (Form S-1), which related to our initial public offering of common stock and a resale of common stock by existing stockholders, which was pending with the Securities and Exchange Commission. We originally planned to raise up to $40 million in an underwritten public offering. However, since that amount would have resulted in substantial dilution of the current shareholders and is far in excess of our immediate requirements, we are instead in the process of preparing our common stock for quotation on the OTC Bulletin Board. A one-year seasoning on this trading platform will allow us, without diluting our shareholders, to apply for listing on a national securities exchange, namely Nasdaq or the New York Stock Exchange, which is fully our intention, assuming we meet all other listing standards at that time. We are optimistic that our common stock will be quoted on the OTC Bulletin Board before the close of the current quarter. With complex structural matters now essentially behind us, we are considering alternate financing strategies to provide capital for future growth, including securing debt financing and selling a portion of our accounts receivable balance. The sale of contractual accounts receivable will raise cash and generate revenue. We currently are in active discussions to complete these components of the short-term funding strategy and intend to raise between $5 million and $10 million as part of this process. The year ahead looks stronger than ever. We plan to grow our workers’ compensation client development and improve its collection process, and we already have embarked on substantial growth plans for our private insurance (PPO) market, which now has clients in 19 states. With baby boomers now reaching Medicare eligibility, their growing numbers also provide us with a solid opportunity. There are currently approximately 44 million patients who receive medications under the Medicare Part D program. We are selling into this market, as the use of medical foods in clinical practice is growing due to wider acceptance among physicians and patients. We still must follow a complex collection process in Part D Medicare that is related to the definition of a covered drug. On February 17, 2012, the Center for Medicare and Medicaid Services published in the Federal Register a definition of a covered drug that is favorable to our efforts to expand our Medicare Part D business. That was great news for us. In what we also believe to be a strong growth opportunity, during the past year we entered the skilled nursing home segment and already have contracted with a major provider of medications to these facilities. Test dispenses have occurred and the billing process is being initiated for multiple reimbursement methods. As thousands of U.S. troops return from the Middle East, we expect to play an important role in treating PTSD with the successful completion of a clinical trial and anticipation of entering this market later in 2012. Protocols also are being developed by the Company in cooperation with the U.S. Joint Forces Command to examine the utility of the pain product Theramine® in the military community. These new business segments should significantly reduce time to collection, as compared to our workers’ compensation business. Additionally, we have completed the initial evaluation of a medical food product for the treatment of asthma, particularly in children, in cooperation with a new collaborative partner. A placebo-controlled trial to test this product is in the final stages of design, and the project will be co-funded by the Company and our collaborating partner. We also have developed an advanced obesity management system, which is now undergoing initial tests. As I mentioned at the beginning of this letter, we are particularly excited about the patents filed earlier this year on the oral stem cell stimulation system—a technology that we believe may be the first stem cell system using stimulation of progenitor stem cells within the body via an orally administered medication. This system would eliminate the need to harvest cells from the body, externally culture the cells and subsequently reintroduce them into the body. Clinical trials were initiated in February to test a red blood cell stimulating system, a neuron regeneration and insulin method, again all via oral administration, with a focus on chronic disease states such as kidney disease, AIDS, diabetes mellitus and chronic arthritis, which are all characterized by reduced red blood cell concentrations. We expect that the products will be developed as medical foods, with each ingredient generally recognized as safe under the FDA’s Generally Recognized as Safe (GRAS) guidelines. Targeted Medical Pharma clearly has undergone solid growth and change. We have overcome some timing setbacks and, at the same time, positioned ourselves for a bright future. On behalf of our Board of Directors and management team, I extend deep gratitude and thanks for your patience and continued support. I hope you will be able to join us at our annual shareholders’ meeting on August 6th, 2012, beginning at 11:00 a.m., at the Palomar Hotel near UCLA in Westwood, California. You will be receiving proxy materials and detailed information concerning the annual meeting shortly in the mail. Targeted Medical Pharma, Inc., a specialty pharmaceutical company that develops and sells prescription medical foods to physicians, pharmacies and skilled nursing facilities for the treatment of chronic disease including pain syndromes, obesity, and sleep and cognitive disorders. Based in Los Angeles, the company’s proprietary pharmaceutical therapeutic systems are sold in the United States and Japan. The company manufactures nine proprietary medical food products, as well as 48 convenience packed kits, which pair a medical food and branded or generic pharmaceutical. These prescription medical food products and therapeutic systems represent a novel approach to the management of certain disease states, focusing on safety and efficacy without the deleterious side effects of traditional, high dose prescription drugs. This press release, including the letter to shareholders, may contain forward-looking statements related to the company’s business strategy, outlook, objectives, plans, intentions or goals. The words “may,” “will,” “should,” “plans,” “explores,” “expects,” “anticipates,” “continue,” “estimate,” “project,” “intend,” and similar expressions, identify forward-looking statements within the meaning of the Private Securities Litigation Reform Act of 1995, but their absence does not mean that the statement is not forward-looking. These statements are not guarantees of future performance and are subject to certain risks, uncertainties, and assumptions that are difficult to predict. Actual results could differ materially. Targted Medical Pharma expressly disclaim any obligation or undertaking to update or revise any forward-looking statement contained herein to reflect any change in the company’s expectations with regard thereto or any change in events, conditions or circumstances upon which any statement is based. Los Angeles, May 2, 2012 – Physician Therapeutics, Inc., a division of Targeted Medical Pharma, Inc., a specialty pharmaceutical company that manufactures and distributes specialty pharmaceuticals to physicians, pharmacies and skilled nursing facilities, published results from a clinical trial of the proprietary medical food Sentra PM. This trial demonstrated improved sleep latency and improved nighttime parasympathetic nervous system activity as a standalone medication or used in conjunction with a low dose of Trazadone. The results of this study have been published in the May issue of the Journal of Central Nervous System Disease (http://bit.ly/SentraPM_Study). The double-blind, four-arm, placebo-controlled study included 111 patients across 12 independent sites that were randomized for treatment with Sentra PM alone, Sentra PM with Trazadone, Trazadone alone and a placebo alone. Results showed improvement in sleep latency for both Sentra PM and the combination of Sentra PM with Trazodone (-41 and -56 minutes, p<0.001). Additionally, there was a statistically significant improvement in the quality of sleep for the amino acid formulation Sentra PM and the combination of Sentra PM with Trazodone (3.86 and 6.48 Likert units on a 10 point scale, p<0.001). The study also found an activation of circadian activity at night in the medical food and combination groups while there was no change in parasympathetic activity in either the placebo or Trazodone group. In the study, which was completed in 2009, subjects underwent baseline screening, informed consent and an initial sleep questionnaire. After 14 days subjects received a second evaluation by questionnaire. At baseline and day 14, 24-hour ECG recordings were given to subjects that were analyzed in the frequency domain of heart rate variability. The specific high frequency parasympathetic autonomic nervous system activity also was analyzed. The primary endpoints were sleep latency and parasympathetic autonomic nervous system improvement in sleeping hours. These data indicate that a medical food is an effective treatment for sleep disorders to potentially addictive sleep aids that have significant side effects. “Sentra PM (A Medical Food) and Trazodone in the Management of Sleep Disorders.” William E. Shell MD, Elizabeth Charuvastra RN, Lawrence May MD, Debbie Bullias BS CRC CRA, Stephanie Pavlik CRA, David S. Silver MD. Journal of Central Nervous System Disease; Published online: April, 2012. Physician Therapeutics is a division of Targeted Medical Pharma, Inc., a specialty pharmaceutical company that develops and sells prescription medical foods to physicians, pharmacies and skilled nursing facilities for the treatment of pain syndromes, obesity, sleep and cognitive disorders. Based in Los Angeles, the company’s proprietary pharmaceutical therapeutic systems are sold in the United States and Japan. The company manufactures nine proprietary medical food products, as well as 48 convenience packed kits, which pair a medical food and branded or generic pharmaceutical. These prescription medical food products and therapeutic systems represent a novel approach to the management of certain disease states, focusing on safety and efficacy without the deleterious side effects of traditional, high dose prescription drugs. Physician Therapeutics, a division of Targeted Medical Pharma Inc. will be exhibiting at the Freedom and Recovery, Integrated Mental Health and Addiction Treatment Conference for serivce memebers and first responders, April 23-26, 2012 at the Hotel del Coronado in San Diego, CA. The exhibit will feature updated clinical data regarding the nutritional management of PTSD and Gulf War Illness as well multimodal nonaddicitive treatment options for pain syndromes. 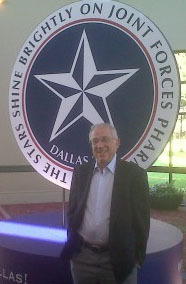 Targeted Medical Pharma CEO, Dr. William Shell, at the 2011 JFPS. Targeted Medical Pharma Inc. which develops and sells medical food products through its subsidiary Physician Therapeutics, exhibited product information and technology related to its medical foods addressing pain management and sleep disorders related to Post Traumatic Stress Disorder to over 2000 active and retired United States Military pharmacists, service men and women at the Joint Forces Pharmacy Seminar in Dallas, Texas from October 31-November 3, 2011. Other exhibitors included Takeda, Teva Neuroscience, Pfizer, GlaxoSmithKilne, Endo Pharmaceuticals and Express Scripts. Los Angeles, CA, Nov. 1, 2010 /Targeted Medical Pharma Inc. a Specialty Pharma company developing proprietary medical food products distributed through subsidiary Physician Therapeutics announced it has been awarded $733,429.00 in government grants. Under the recently enacted Patient Protection and Affordable Care Act, cash grants were awarded to Qualifying Therapeutic Discovery Projects that showed significant potential in producing new and cost-saving therapies, support job growth and increase U.S. competitiveness. Grants were awarded through a competitive application process supervised by the National Institutes of Health. All three of the Company’s applications were awarded. The first involved the reduction of gastrointestinal hemorrhage by Theramine associated with treatment of back pain syndromes. The second involves reduction of the side effects associated with sleep disorders in the elderly with Sentra PM and GABAdone, and the third addresses a safe and effective treatment for symptoms of Gulf War Illness with Sentra PM and Sentra AM. The Company will be able to expand the growth of these and other innovative products with these funds.